Over 100 suggestions for personalizing the cocktail hour! The cocktail hour is in fashion. This festive interlude, short and easy to prepare, can be arranged on the spur of the moment during the week, as well as on the weekend. It involves both the art of mixing cocktails and the world of wine, both of which arouse great interest, as attested to by the multiplication of wine and cocktail bars and the many workshops on wine tasting. Sommelier Marie-Josée Beaudoin has served her share of aperitifs! To clients in restaurants where she has worked, to her friends, and to her family. Her conclusion: often for lack of ideas, people order classic cocktails and wines they are already familiar with. However, the cocktail hour is a terrific opportunity to innovate, to dare to try new flavour combinations, and to choose products that are surprising or that perfectly capture the feeling of the moment – because you don't drink the same thing at a cocktail hour with workmates as during a romantic evening or at a family brunch! 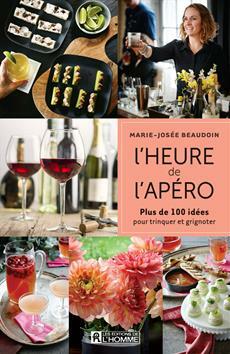 In this book, Marie-Josée Beaudoin has set out ten themes for which she suggests punches, cocktails, red and white wines, sparkling wines, champagnes, beers and non-alcoholic aperitifs. Affordable and well-suited to every occasion, these products, aimed at a broad audience, are the sommelier's favourites. For each theme, a chef offers three gourmet ideas to savour while raising a glass. - The author's very personal and unpretentious tone. - Some of the more complex concepts pertaining to wine are explained in terms anyone can understand.